Synonyms: Coius microlepis (not valid, see discussion). 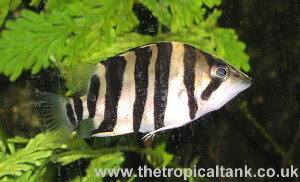 Size: 18" (45cm), but usually smaller in aquaria. Compatibility: Predatory, will eat smaller fish. Keep with other large non-aggressive fish. Feeding: A predatory carnivore, but it is not usually difficult to wean the fish onto dead meaty foods such as whitebait, cockles, mussels and prawns. Bloodworm, krill and brine shrimp are also suitable for juvenile fish. Most individuals will also take pellets after a while, but it can take time. Comments: A very striking fish which has a deeper body than other Datnioides species. It was originally referred to by the common name of 'Fine-scaled tigerfish' before D. pulcher and D. undecimradiatus were described, which share the finer scales (in comparison to D. quadrafasciatus and campbelli). These fish require very good water quality to thrive. They seem to be relatively slow growing in the aquarium, and are unlikely to reach the max size quoted for wild specimens. D. microlepis appears to be more boisterous than the very similar D. pulcher, and may show persistant aggression towards other tigerfish.